Organizers of the Visit Davao Fun Sale have teamed up with one of the city’s hottest night spots, the MATINA TOWN SQUARE (MTS) in bringing to the visitors and the locals the most exciting parties to end the city-wide tourism sale program. Dubbed as a Visit Davao Summer End Party, HEAT WAVE will be staged in the MTS Pavilion on May 16, 2015. Referred to as the Heat Wave, the EDM party in MTS will feature renowned DJ Martin Pulgar, head resident DJ of Manila’s hippest club, Valkyrie. Local talents DJ Nikki Rose, DJ Brylle, DJ Ronn Mirage, MC Klawn and MC Lemuel will also heat up the night with beats that will make you remember the happiest days of summer. HEAT WAVE will also be a BLACK LIGHT PARTY, so we encourage partygoers to dress up or accessorize in luminous colors! The best part about the VDFS EDM PARTY AT MTS is that entrance is ABSOLUTELY FREE, and Visit Davao Fun Sale passport and mobile app holders can participate in the raffle contests and other in-event promotions. For more details about the event, please visit www.visitdavaofunsale.com or blog.visitdavaofunsale.com . Passport and mobile app holders may continue to enjoy discounts and freebies from over 200 participating establishments of the Visit Davao Fun Sale until May 17, 2015. PREP (PR, Events and Promotions) is a member of MICE Organizers Ventures Davao (MOVE Davao), the official events organizing association of Davao City, under the Department of Tourism. 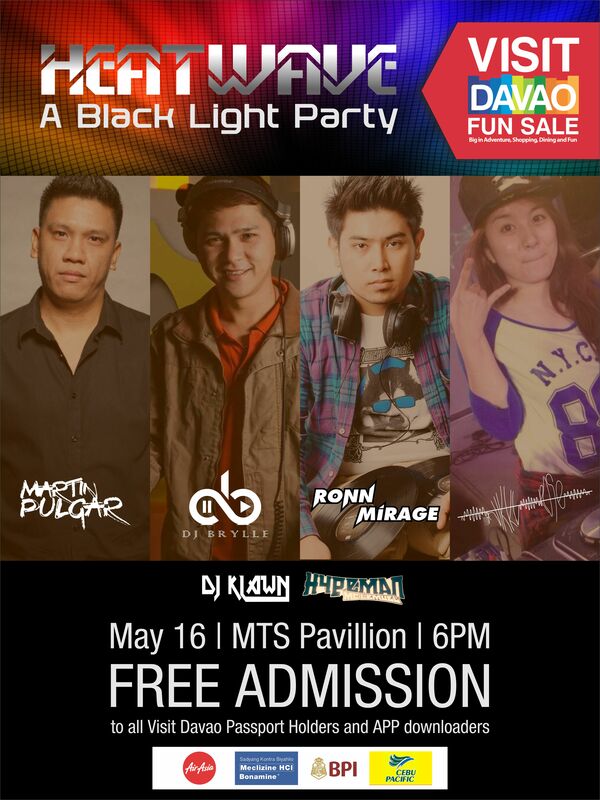 PREP is one of the core organizers of the Visit Davao Fun Sale EDM Party at MTS.